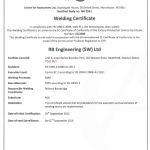 If you are looking for a fabricating and welding company that you can trust, that is small enough to care but big enough to cope, that has recently achieved level 3 certification in CE Marking, then you need to enlist our services. Our CE Marking certification is recognition of our outstanding workmanship and quality and opens up so many doors for you to grow your business. In its simplest form CE Marking is a way of creating a level playing field for manufactured products across the European Economic Area (EEA). 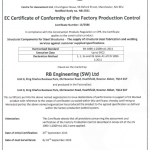 Before CE Marking, each country has its own requirements that a product had to comply with. But now, if your product carries a CE symbol then it can be traded freely across the EEA without having to meet local requirements. Not all products can carry the CE Mark, only those that meet the standards set in the directives with regards to design safety and administration. Only companies such as ourselves, who have CE Marking certification, can produce products that carry the CE symbol. 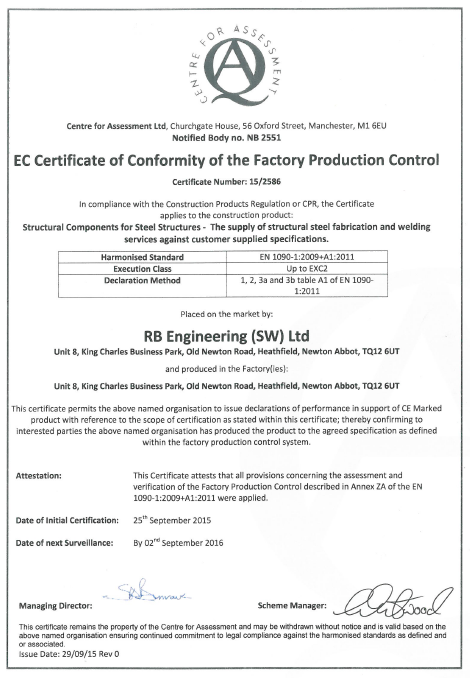 What are the advantages of CE Marking? With a CE Marking on your product you can trade safely within any EEA country. Claims for damages and liability will be limited as products will be provided with safety instructions for users. Products are safer for users. Improved product design. As we go through the steps for CE Marking we will do a thorough review of the product which will often highlight innovative solutions. Improve production rates. To conform to certain aspects of the directives we will undertake quality assurance tests which can present ways of simplifying the manufacturing process which will reduce costs. What opportunities does it open? According to the Office for National Statistics, in 2014 UK exports to EU countries was over £200 billion, and it has been over that 200 mark since 2010. 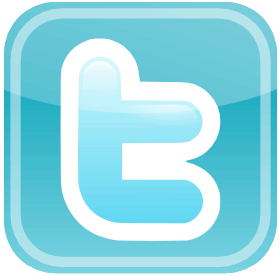 Having a CE symbol on your product makes it far easier to have a piece of this market. Being solely reliant on the UK market might be ok for now, but for long term growth the more markets that are open to you the better. The export market could be the next step for your business and we can help you with that. 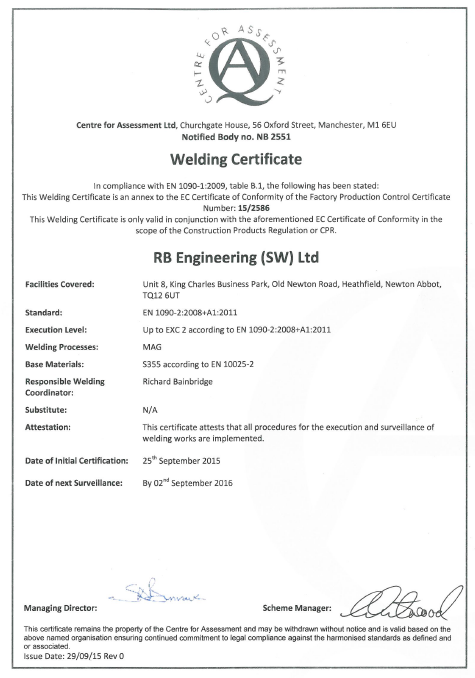 Not all fabricating and welding companies have the ability to self certify compliance with CE directives, but we do. This means that if you want to ship your products to anywhere in the UK or Europe, we can save you time and money. 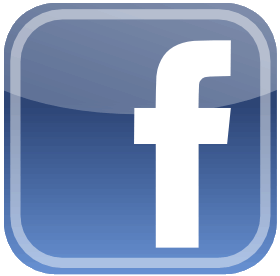 We have undertaken extensive training so that the goods that we produce for our clients can carry the CE symbol. Our staff have attained level 3 CE marketing certification which is the highest level for a manufacturer. We have not only invested heavily in staff training but we also invest in the right equipment for the right job. For example, we have recently purchased a Flow Dynamic IFB abrasive waterjet cutting machine. This means that not only will you be dealing with expert and knowledgeable staff but that they have the tools needed to deliver on big projects. By using a company that cannot carry out CE Marketing self certification there is the risk that you could end up with an inferior and sub standard product. You will definitely not be able to trade in Europe and there is more chance that you could have an expensive lawsuits filed against you. You will not have any of those problems with us. The CE Marking that we place on products is not just a symbol to let other countries know that we comply with the directives, but more importantly than that, it is our commitment on quality and service to our clients. More information on CE Marking can be found on the Government’s Guidance website.